Illustration from "the Art of Perfume" published in 1912 (pochoir print). Pochoir is a direct method of hand coloring through a stencil. The stencil itself is usually knife cut from thin-coated paper, paperboard, plastic or metal and the ink or paint is applied with a brush through the stencil to the paper beneath. Multi-colored pochoirs are produced with multiple stencils, and the technique has often been used to add colors to black and white lithographs. George Barbier was one of the great French illustrators of the early 20th century. 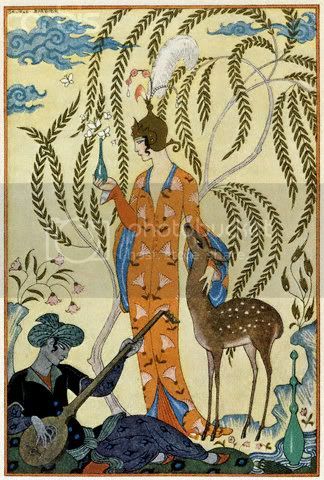 Born in Nantes, France on October 10, 1882, Barbier was 29 years old when he mounted his first exhibition in 1911 and was subsequently swept to the forefront of his profession with commissions to design theatre and ballet costumes, to illustrate books, and to produce haute couture fashion illustrations. For the next 20 years Barbier led a group from the Ecole des Beaux Arts who were nicknamed by Vogue "The Knights of the Bracelet"—a tribute to their fashionable and flamboyant mannerisms and style of dress. Included in this élite circle were Bernard Boutet de Monvel and Pierre Brissaud (both of whom were Barbier's first cousins), Paul Iribe, Georges Lepape, and Charles Martin. During his career Barbier also turned his hand to jewellery, glass and wallpaper design, wrote essays and many articles for the prestigious Gazette du bon ton. In the mid 1920s he worked with Erté to design sets and costumes for the Folies Bergère and in 1929 he wrote the introduction for Erté's acclaimed exhibition and achieved mainstream popularity through his regular appearances in L'Illustration magazine. Barbier died in 1932 at the very pinnacle of his success. Winners will be randomly chosen from all the qualifying entries on October 1st. Our sponsors this month are sponsors: Sea of Glass, and Shaterra please visit us tomorrow to see the prizes! Please add the tag or title SEP ABS to your photos. Include a short description, who created the art beads and a link to your blog, if you have one. Deadline is September 30th. Photos are approved by our moderators, if a photo hasn't followed the guidelines it will not be approved. You may upload 2 photos a day. I immediately pictured those leafy vines falling around a neck cuff. Excellent choice for the challenge, Heather! What a great piece of art! Ideas are already whirling around in my head. What an exciting choice! I am captured by all the curvy movement in the composition, although the motif is actually so still. Interesting contrast there. I will have to scrutinize the picture thouroughly, too discover all the wonderfully shaped details, there are so many. Very attractive colours too. I'm totally up for this one! I love the pallette, and always engage on a garden theme. Love this and already am getting inspired as to what to create. Cheers. the colors and lines of this are beautiful..very inspiring.. Yes, I agree, I love the colors and patterns in this piece. I finally had a chance to try a challenge again. Thanks for being a major source of inspiration and motivation for me!